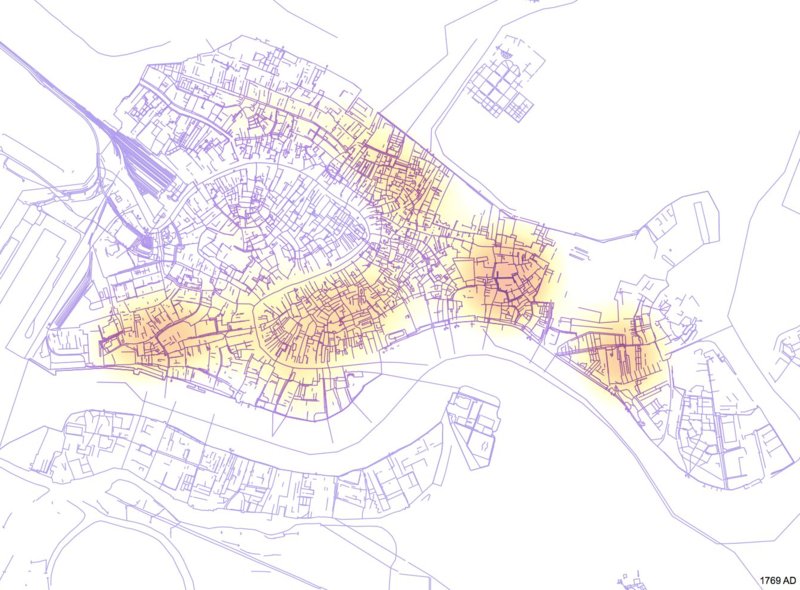 In my previous blog post, I explained my project “Models of Early Modern Charity: The Example of Venice,” which I was transitioning from the WorldMap platform into QGIS. Since my data was initially in an Excel spreadsheet, a safe and stable platform, all I had to do was import my spreadsheet as a .csv file into QGIS. In my last post, I showed how I had made my map categories more specific and, using a plugin called TimeFrame, I was able to show the foundation of Venetian hospitals through time. Continuing to use TimeFrame, but moving away from my categories based on the patronage of these institutions, I created a heat map that shows the foundation of charitable organizations through time. Essentially, this is a heat map of charity in Venice, and it is interesting to see clusters in specific neighborhoods. Below is a screenshot of the video created with TimeFrame, and you can see the hot spots of charity in Venice by the end of eighteenth century. As you can see from the image above and my previous post, my project employs a modern-day map of Venice. While it would be possible to have historical maps as layers, the broad time frame of my project makes the selection of one specific map difficult. Rather, due to my particular research interest in early modern Venice, I am interested in narrowing this project to the fifteenth and sixteenth centuries. To make the data more relevant, however, I would like to incorporate a map or diagram that shows the contemporary parishes in each one of the six districts (known as sestieri in Italian) in early modern Venice. Established in ca. 1100, parishes were communities separated from each other by water, and by this date, most of Venice’s seventy parishes had been instituted. In essence, they helped the government administer the city. Currently, I am in the process of researching Venetian parishes and changes that have occurred in their division in order to find a diagram that accurately depicts their boundaries in the early modern period. I have experimented with two diagrams already, but I am running into issues as I try to georeference and overlay them on a modern-day map due to the original diagrams’ lack of inaccuracy. My search continues, and I hope to have a successful report on my next post!